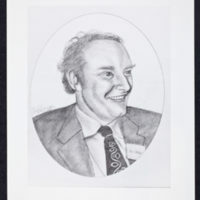 Photograph of pencil drawing of Francis Crick by Gerard E. Semala. Photograph by Miriam Chua. Tags: Chua, Miriam~ Pencil drawing~ Semala, Gerard E.
Workshop on Schizophrenia group portrait. Includes Watson. Photograph by Miriam Chua. 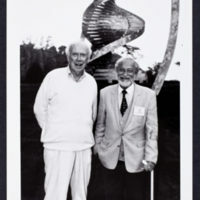 Watson and Phillip Tobias infront of double helix sculpture. 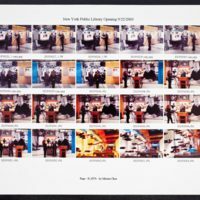 Photograph by Miriam Chua.